One Sunday morning during service, a 2000 member congregation was surprised to see two men enter, both covered from head to toe in black and carrying sub-machine guns. One of the men proclaimed, “Anyone willing to take a bullet for Christ remain where you are.” Immediately, the choir fled, the deacons fled, and most of the congregation fled. Out of the 2000, there remained only around 20 people. The man who had spoken took off his hood, looked at the preacher and said, “Okay Pastor, I got rid of all the hypocrites. Now you may begin your service. Have a nice day.” And the two men turned and walked out. A friend sent me the preceding short story. While I suppose something like that could happen (anything is possible), it’s more than likely simply a made up story. If you have reason to believe otherwise, I would love to see the link to the real story. Having said that, I remember an incident a couple years ago where a gunman did open fire in a church building. I wrote about it here. 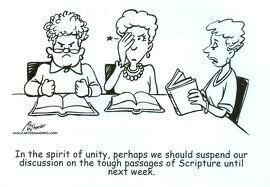 · Is the average church filled with hypocrites? “Hypocrite” is defined in my dictionary as, “a person who pretends to be what he is not, especially one who puts on an appearance of goodness or religion.” So a hypocrite is a pretender. Are there pretenders in our church gatherings? If I were a gambling man, I’d bet on it. The only question is, how many? · Is our faith a faith of convenience? It is easy to be a Christian in our North American society. Unlike many of the Christian martyrs around the world today, our version of Christianity is really quite easy in that it doesn’t cost us anything. Belonging to most institutional churches today is comfortable, much like belonging to a secular club somewhere. Anyone for golf? · How far would you go before turning denying your Lord and running away? We have not yet suffered to the point of shedding our blood for our faith. If real persecution were suddenly to land on our shores, would we still be found in our church buildings, or would we turn renegade and run out the doors? · Would you be prepared to die for your faith if it came to that? Now there’s a loaded question. I’d like to say the answer is yes, but I suppose we really wouldn’t know until we were actually faced with that very scenario. He died for you and me; would we die for Him in return?